During this fall, we have been introduced to various business related topics. In the “New Service Development and innovative services systems” course, we have learned the basics of blueprinting and how to create a business model canvas. Course objectives include; students can create a plan for developing a service concept and also evaluate and improve an organisation’s service development process. Each of us had prepared a blueprint and a canvas for one service and on thursday 12th of December we gathered together to present our assignments to the class and to workshop our ideas further together. In the morning we had some extra topics in the schedule. First we got introduced to our upcoming final thesis and got a little pre-assignment for the first official thesis workshop in January. Then we had a presentation of the Service Design Global Conference 2013, Our fellow student Katrin Mathis attended the conference and presented her key findings to the rest of the class. Accompanied with comments from another attender, our fellow student Itziar Pobes, the rest of the group got good insights into the event. Katrin’s excellent blog post about the SDN conference can be found here. For our blueprint and canvas -presentations, we were divided into smaller groups. Each student presented his/her project to the group, and together each group chose one project to be developed further in the afternoon workshop. I presented my fictional plan for e-commerce and retail and my idea of the personalised e-shop customer experience was chosen for further development with a help of CoCo tool kit. 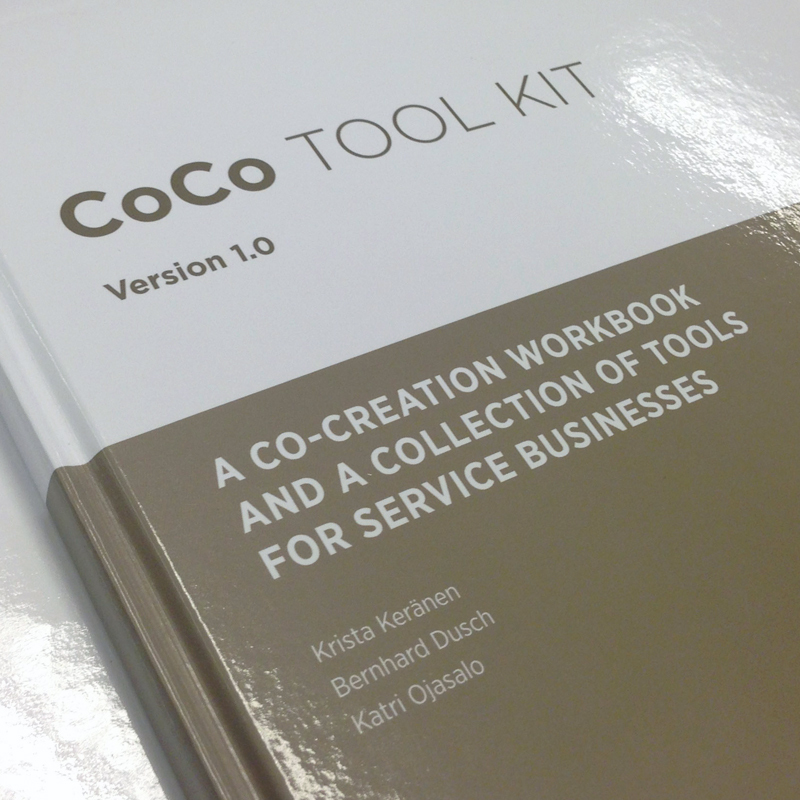 CoCo tool kit is created in co-operation between Laurea University of Applied Sciences and the University of Cambridge. It was a parallel project to VTTs (Technical Research Centre of Finland) ServChange project. Authors include: Krista Keränen, Bernhard Dusch and Katri Ojasalo. We got a special introduction to the topic, since one of the authors Katri Ojasalo is also our teacher on this course. The tool kit is a collection of five tools and a workbook. And it is designed to help businesses in their challenges in co-creation activities. You can read more about the tool kit here. On the left: The Co-creation workbook found in the box. On the right: CoCo author, our teacher Katri Ojasalo (on the left side), presenting tools and toolkit to our group. Antti Kytö and Nanda Kumar (on the right side) are listening.